It’s sometimes the welcome lot of parents to be upstaged by the lives and work of their children. When the parent in question is the founder of a world-changing system of political philosophy which then bears his name, the child may vanish beneath the presence of such a virtual sibling. There are elements of such disappearing in the case of Karl Marx’s youngest daughter Eleanor, better known as Tussy, though they are deceptive and, on investigation, turn out to be very far from the full picture. The expansion and investigation of this picture are at the heart of Lucy Kaufman’s intriguing new play, The Jewess of Jews Walk. Though Tussy’s own life was short and her death tragic, her list of achievements was long and inspiring. While her father was hard at work on Das Kapital, Eleanor was doing some welcome upstaging in his study, playing games and inventing stories. She had been able to recite passages from Shakespeare from the age of three and, later in her life, after an intense period of political activism in her own right, was an actress. Elsewhere there are similar linkages of “big” and “little” politics which knowingly verge on the comic. Eleanor again: “Everyone I love has gone. Even The Cause. I fear for socialism in France with my sister and brother-in-law at the helm.” Straight from The Marxes of Manchester, if there were such a thing. In fact, this is not the industrial cauldron of the north, but suburban south-east London within, well, striking distance of the 100-seat Sydenham Centre where the play is being staged. For Spontaneous Productions, the author’s brother Jonathan Kaufmann directs with vigour and variation. As Tussy surely was, Sarah Whitehouse’s portrayal has her as alternately powerful and vulnerable, her campaigning energies matched and marred by her profound sense of impotence. With David Sayers’s chilly, indeed chilling Aveling, their exchanges wrestle and wrangle through the impossible thickets of romantic and revolutionary ideology. They fall into a language that keeps threatening to distance them from self-knowledge. At times, for all the Englishness of such impasses, we could almost be listening to a translation from the European. Yet the meaning is as clear as the core of Marxism itself: we have nothing to lose but the chains of our selves. Partly funded by Arts Council England and championed by Eleanor’s biographer Rachel Holmes, this powerful piece explores the last few tumultuous months of Karl Marx’s youngest daughter – and in her own right – an actor, translator (of her father’s works as well as Flaubert and Ibsen), a political campaigner, social activist and very much a woman ahead of her time. In 1896 she moved to No 7 Jews Walk, Sydenham – self-styling herself ‘The Jewess of Jews Walk’ – with her common law ‘husband’ Edward Aveling. What happened there remains a mystery to this day, though the coroner ruled that she died of self-administered prussic acid poisoning in 1898. But was it suicide or murder? 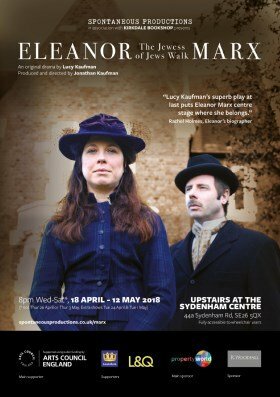 Lucy’s drama confronts themes of love and betrayal, domestic abuse and the role of women in Victorian society. Directed by Spontaneous Productions​’ Artistic Director Jonathan Kaufman​ and features Sarah Whitehouse ​as Eleanor Marx (Tussy) and David Sayers​ as her common-law husband Dr. Edward Aveling.